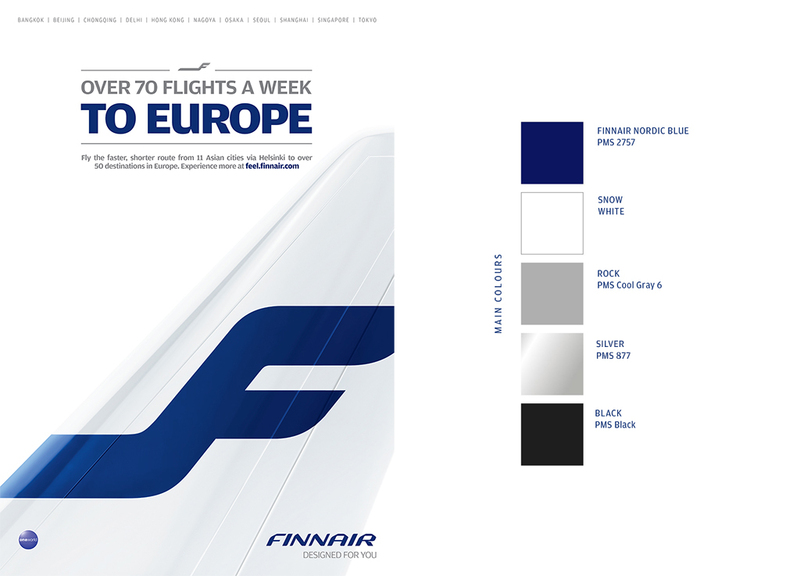 Did you know that Finnair has its own signature colour called Finnair Nordic Blue? And that the “F” emblem has been an iconic symbol since 1968? These are just two of the many elements encompassing Finnair’s identity. While the visual elements may have evolved throughout the decades, the updates have always stayed true to Finnair’s design heritage, which embodies a truly Nordic smooth travelling experience. Finland is known as the land of a thousand lakes, so naturally blue is the best colour to represent Finnair. The deep navy colour was informally named Finnair Nordic Blue in 2010 after evolving from a light morning sky hue. Finnair Nordic Blue is often accompanied by snow white, rock grey, and silver – forming a colour palette inspired by the purity of Nordic nature. Originally operating as Aero O/Y, Finnair officially started using its new name in 1968. That was also the year when graphic designer Kyösti Varis designed a logo that features a blue ball symbolising the globe with a graphic “F plane” flying across. The redesigned and current logo was launched in 2010, retaining the use of the “F” emblem that resembles the silhouette of a plane. 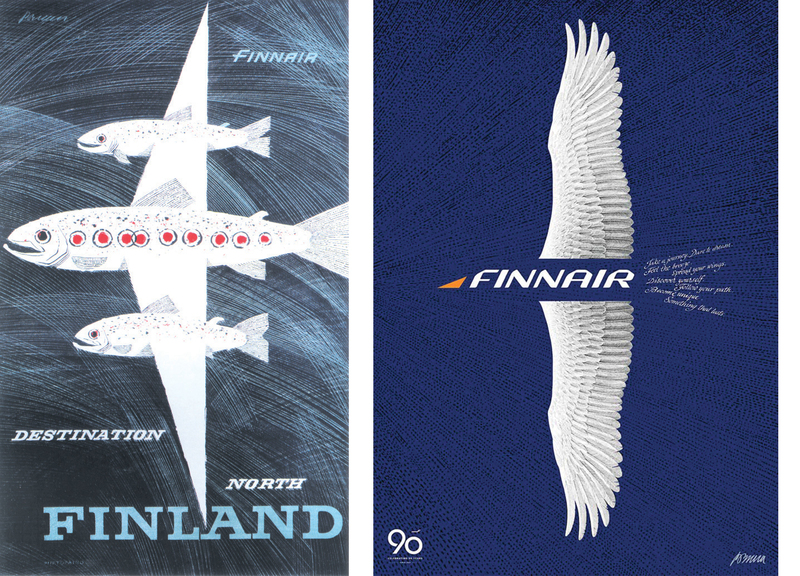 Finnish graphic artist and nature lover Erik Bruun is known for his iconic posters, of which Laxflygplan, a plane made of three flying salmons featuring the words Destination Finland, he designed for Finnair in the 1950s. About 60 years later, Bruun designed Finnair’s 90th-anniversary poster, this time featuring the bold wings of a swan. From naming a plane after the Finnish national hero Jean Sibelius to unveiling a look sporting the Moomins characters on a Finnair McDonnell Douglas MD-11 in 1995, Finnair delights its passengers with special livery. Highlights include an on-going collaboration with Finnish design house Marimekko: one Airbus A350 features the classic Kivet pattern while an Airbus A330 is decorated with colourful Unikko poppy flowers – in blue, of course. 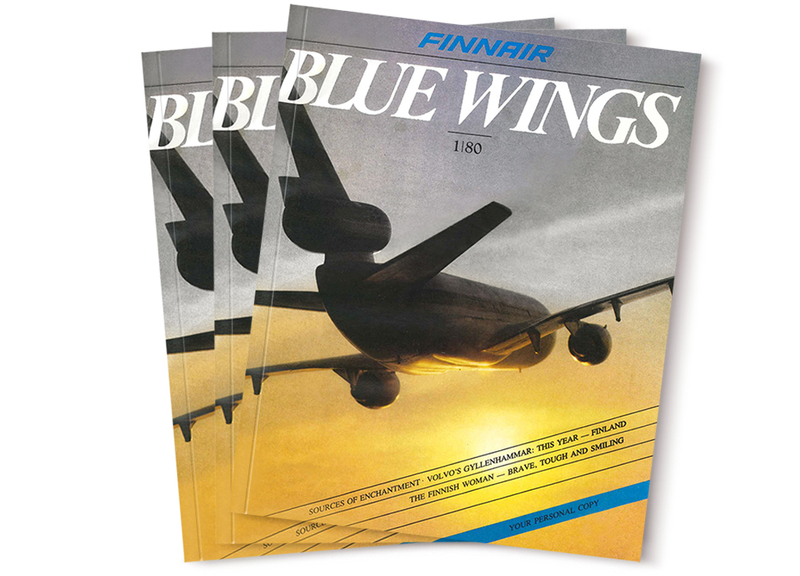 Blue Wings, one of the world’s oldest inflight magazines, has been keeping travellers company onboard since 1980 with inspiring stories from Finland and abroad. Thirty-eight years later, Blue Wings is still a global lifestyle magazine covering design, business, technology, and international travel trends. Whereas some readers will always prefer the print version, the magazine is also available online and features online-only stories.